Freesia is a summer bloomer that will produce flowers in a variety of shades atop slender, sword-shaped foliage and thin, sturdy stalks. If you live in a climate with warm winters, plant freesia in August or September. Otherwise, plant freesia in the spring. In a few months, you can enjoy the beauty and subtle fragrance of the freesia flowers. Select a sunny, well-drained location to plant freesia. Use a shovel or garden fork to loosen the soil to a depth of 8 to 10 inches, then work in 2 to 3 inches of compost, manure, bark mulch or peat moss. Dig a hole for each freesia bulb, allowing 2 to 3 inches between each bulb. Plant the freesia bulbs in the holes with the rounded end down. Water the area deeply immediately after planting. After that time, keep the soil moist but not soggy. 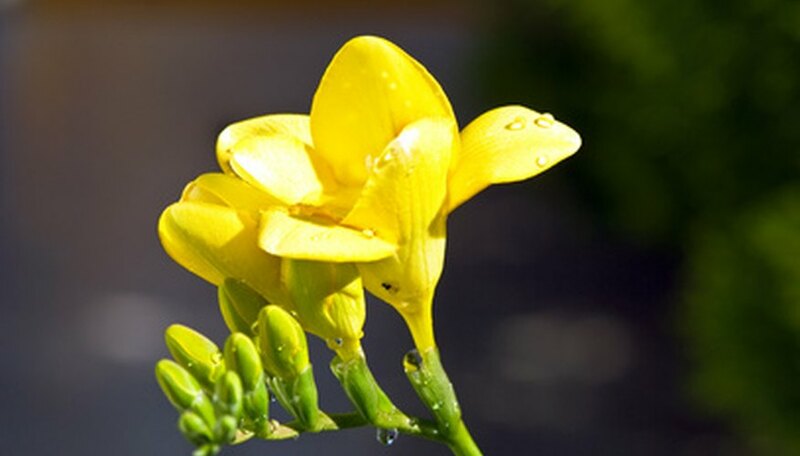 Fertilize freesia when the flower stems appear. Use a liquid fertilizer for blooming plants, applied according to the directions on the package. Cut freesia flowers as often as desired. Freesia can be used in cut flower arrangements, and trimming the blooms won't hurt the freesia plant. Leave the freesia foliage in place after the plant is finished blooming, as the foliage provides energy to the bulbs for next year's blooms. Remove the foliage when the leaves wilt and turn yellow. Dig the freesia bulbs after the first hard frost if you live in a cold climate. Spread the bulbs in a warm, dry, well-ventilated spot for two to three weeks. Discard any soft or rotted bulbs. Place the bulbs in labeled paper bags and store the bags in a cool, frost-free room until spring.